I wrote about this a year and a half ago and I want to encourage you to try it. It gets better every time I make it. 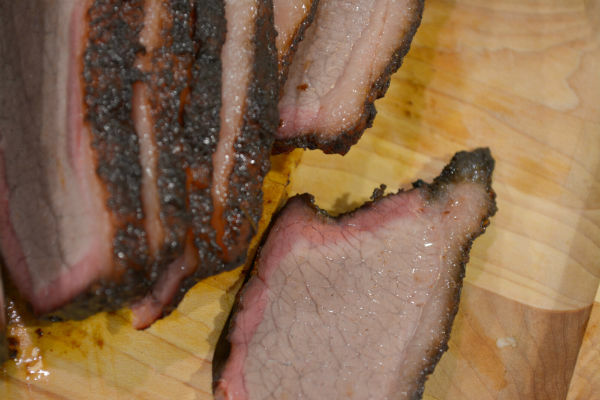 Smoking a brisket is not like baking a cake. It is not exact. 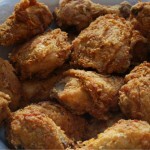 The constant is, bring the internal temperature of the meat to about 160 °F. The meat will be succulent, caramelized and very dark on the outside, a red smoked ring and then juicy meat to be sliced thin across the grain to eat plain or put in a killer sandwich. There are so many variables, the style of your smoker, the size of the brisket, the temperature and weather of the day and on and on. 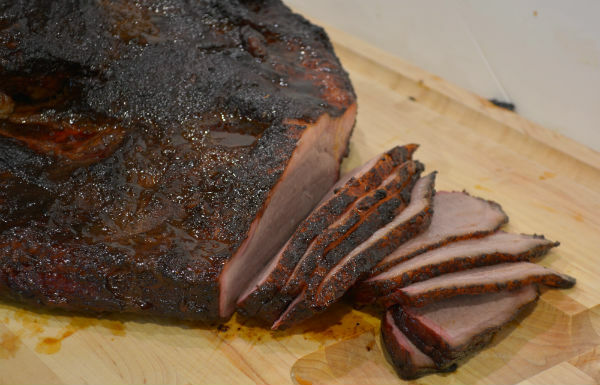 Pick a brisket that is whole, thick and with 1/4 to 1/2 inch of white fat on the top side. 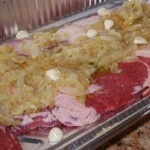 Do not use a super trimmed brisket, the fat needs to drip and will keep the meat moist. It takes all day, about 8 to 10 hours to smoke a whole brisket. I started in the morning, placed the brisket on the smoker at 11 AM and we ate dinner at 8 PM. Adjust your start time to earlier in the day for early dinner. Once the brisket was on the smoker I had 3 hours to leave and do my errands. I returned home, applied the ‘mop’ with a brush, turned up the temperature and peaked in every hour or so to reapply the ‘mop’ until it started to look done. At that point I took the internal temperature of the brisket with an instant read thermometer that I use for other meat. I removed the brisket to a large roasting pan when it reached the right temperature and covered it with foil to keep warm and let the juices set. 1. To prepare brisket, combine all rub ingredients. Rub all over dry brisket and let it sit for a few hours or better still, overnight Take brisket out of refrigerator at least one hour before placing on smoker. Prepare smoker. 2. 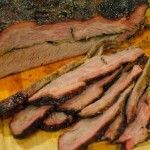 Place brisket in smoker at a cool temperature of about 135 to 140° F for about 3 hours. 3. Turn temperature up to 225° F for the next 5 hours or so. After you turn up temperature, apply mop liquid with a long handled brush every hour or so to the whole surface of brisket. The mop keeps brisket moist and caramelizes the outside of meat. 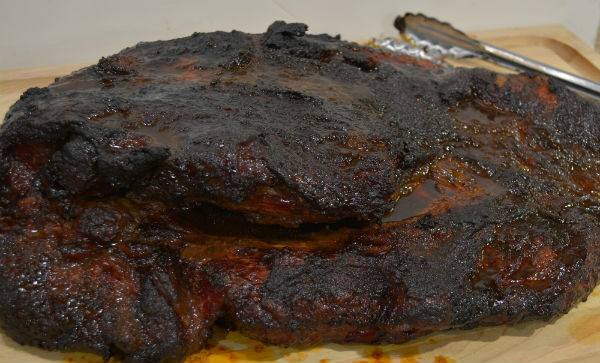 When internal temperature of brisket reaches 160° F, remove brisket from smoker. 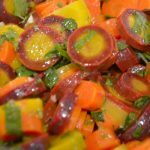 Place it in a large baking dish or roasting pan. Cover it with foil to keep the heat in and let it rest for about 20 minutes before carving. Serve with baguette or rye bread and condiments for sandwiches. 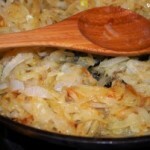 Serve with baked beans, Cole slaw and potato salad or latkes and apple sauce for Chanukah. Smoking involves slow cooking with a closed lid and with meat over indirect low heat and some kind of wood providing flavor via smoke. 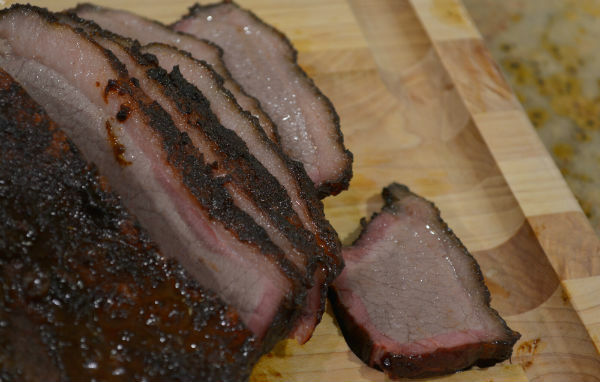 Hickory wood smoke is supposed to be better then mesquite for brisket. So I used hickory and would recommend that. Just a note, I used a non alcoholic mop, many people use beer or other alcohol in the mop for the liquid component instead of chicken stock.